prayer | Rick Washburn, Jr. I believe in the power of prayer. I believe that you believe in the power of prayer, or you probably wouldn’t invest the time to go to a prayer meeting, or to spend personal time in prayer. I imagine that you could tell stories of answered prayers in your life, and you can probably quote some verses that refer to the power of prayer. But let me challenge you to dig into a verse that gives one of the keys to a powerful prayer life. In the last chapter of his epistle in the New Testament, James pens an entire passage that illustrates the power of prayer, when we are going through trials, when we are sick, or when we have sinned. He even gives an example of a powerful prayer warrior named Elijah. But all of these thoughts culminate in the phrase at the end of vs 16: “The effectual fervent prayer of a righteous man availeth much.” Let’s dig into those words, and try to discover the key to a powerful prayer life. An important part of studying a text is to define the words, not so much in the secondary language (English), but in the words originally used by the author, and inspired by God Himself. Effectual fervent – In English these are two words, but they are translated for a single word in Greek. These two words appear in the KJV in other places, but are not always the same original word. James uses the word energeo, which means to work, function, produce, be in action. In other parts of the KJV New Testament energeo has been translated “accomplish,” “brought about,” “effective,” ” effectually worked,” “performs … work,” and “works.” The idea is pretty clear. James is referring to prayer that actually accomplishes things, that gets things done in the spiritual realm. Availeth – The word James used is ischyo, which means to be strong, powerful, mighty; to be capable of, to be healthy. In other New Testament places it is translated into English as “able,” “strong enough,” can do,” “healthy,” “overpowered.” That power and potential is intensified by the word “much,” (Gk poly: many, much). 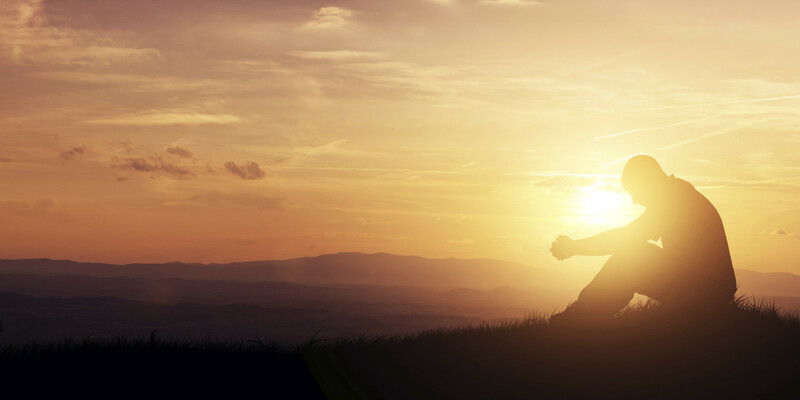 In other words, prayer can reach a place of great power, tremendous might, incredible strength. Righteous man – These two words also come from a single Greek word: dikaios. It speaks of a person who is righteous, just, and upright before God. It speaks of someone’s personal relationship with God. The other phrases in this verse revolve around this one, point back to this one. So, as we bring these words and definitions together, we see that prayer has unbelievable power and potential to accomplish great things, to perform unbelievable works, to be incredibly effective in someone’s life and in the Kingdom of God. But here is the key: it all revolves around a person’s relationship and standing with God. They key to a powerful prayer life is your own walk with God. All throughout the Scriptures you read of promise after promise, blessing after blessing, that are directed at the righteous, the just, those who are upright before God. Psalm 34:15, 17, 19 The eyes of the LORD are upon the righteous, and his ears are open unto their cry. …The righteous cry, and the LORD heareth, and delivereth them out of all their troubles. … Many are the afflictions of the righteous: but the LORD delivereth him out of them all. Proverbs 11:28, 30 He that trusteth in his riches shall fall: but the righteous shall flourish as a branch. …The fruit of the righteous is a tree of life; and he that winneth souls is wise. Proverbs 15:6, 29 In the house of the righteous is much treasure: but in the revenues of the wicked is trouble. …The LORD is far from the wicked: but he heareth the prayer of the righteous. There are so many more passages we could read, but you get the point. There is a direct link between the righteous (those who pursue righteousness and godliness in their life) and the promises and blessings from God. And those promises include your prayer life. The term righteous does not speak of people who are perfect or sinless, but of those who have humbled themselves before God in repentance, and have been clothed by the righteousness of Jesus. Righteousness always comes through repentance and faith, not just to be saved, but also to walk uprightly as a Christian. These promises are for believers who walk in submission, obedience, and humility before the Lord Jesus Christ. One of the beautiful things about prayer is that it allows us to get to know the LORD. Maybe not when our prayers are just long “wish lists” or special orders that we place in God’s inbox. But when you and I spend time with our Father, our Abba, our Daddy, opening our heart, expressing praise and thanksgiving, seeking forgiveness, wisdom, direction, encouragement, and so much more, we come to experience our Heavenly Father in a personal way. I believe King David experienced the LORD like this. He spent hours and days, from his boyhood years, out in the fields with the sheep, probably talking to the LORD, singing to the LORD, crying out to the LORD. And through all those daily, personal experiences in prayer, David got to know the LORD, not just as God, Creator, and King, but in a role that he understood well: the role of “shepherd.” In the most famous psalm in all the Bible (the one Spurgeon called “the pearl of the psalms”), David helps us also to get to know our Shepherd through prayer. When I became the pastor of Vandalia Baptist Temple, I inherited the Shepherd Staff from my predecessor, Troy Todd. It is a large, wooden staff that symbolizes my role in serving this local church. The Bible uses the word shepherd to describe the role of a pastor. But on a much higher level, the Bible compares the LORD to a shepherd, and even describes Jesus as the “Chief Shepherd” (1 Peter 5:4), far higher than any earthly shepherds or pastors. David uses the holy name of God: Yahweh (translated “LORD” with all caps in the KJV; at times, “Jehovah”). There was no doubt who he was referring to. In fact, the name Yahweh, Jehovah, LORD is understood by many to be an Old Testament reference to Jesus Christ, God the Son, the Creator Himself. So the New Testament references to Jesus as the Good Shepherd, or the Chief Shepherd, are no coincidence (John 10:11, 14-16; Hebrews 13:20; 1 Peter 5:4). He is the same Shepherd that David got to know in a personal way. 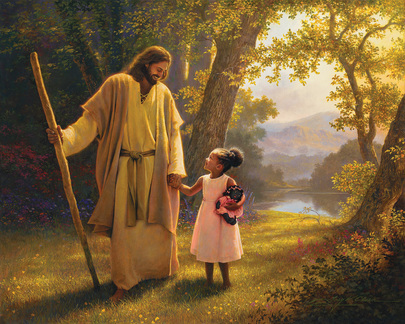 The LORD wants to be a personal shepherd to you. David said, “The LORD is my shepherd. I am a shepherd, but the LORD is my shepherd.” He says so with confidence (not “if” or “I hope”). He speaks in present tense (“is”). David was looking out for his father’s sheep, and caring for them in so many ways, but David knew that there was Someone who was looking out for him, who was caring for him in countless ways. That was the inspiration of this psalm. God wants to have a personal relationship with you, as your Shepherd. Not just as your Savior, but as One who is an intricate part of your daily life. Someone whom you spend time with every, single day. This is not a chore or a burden; it is a priceless blessing. The LORD is a personal shepherd, and you can experience that through prayer. Prayer makes this more than theory; prayer makes it a reality. The fact that the LORD is our personal Shepherd means that He is there to meet the needs that we face. “I shall not want.” The word want refers to being needy or destitute (Merriam-Webster). David uses the Hebrew yiqtol, which refers to being devoid of, having too little of, or being deprived of something. A shepherd takes care of the needs of his sheep. And having the LORD as our Shepherd is an implied promise that He will not allow us to be deprived and destitute of life’s essentials. While you and I struggle to distinguish between wants and true needs, God repeatedly promises to meet the needs of His people (Matthew 6:31-33). Jesus reminds us that our part is to seek God’s kingdom and God’s righteousness, but His part is to take care of life’s essentials (Philippians 4:19). Our seeking the LORD, seeking the Shepherd, is done through our personal prayer life (Matthew 7:7-11). When we seek the LORD in prayer, we have no legitimate reason to worry. He is our Shepherd; we shall not want. You and I can get to know our Shepherd through prayer. We will get to experience the LORD in a very personal way (“my” shepherd), and experience Him meet the needs in our life, family, home, church (“I shall not want”). 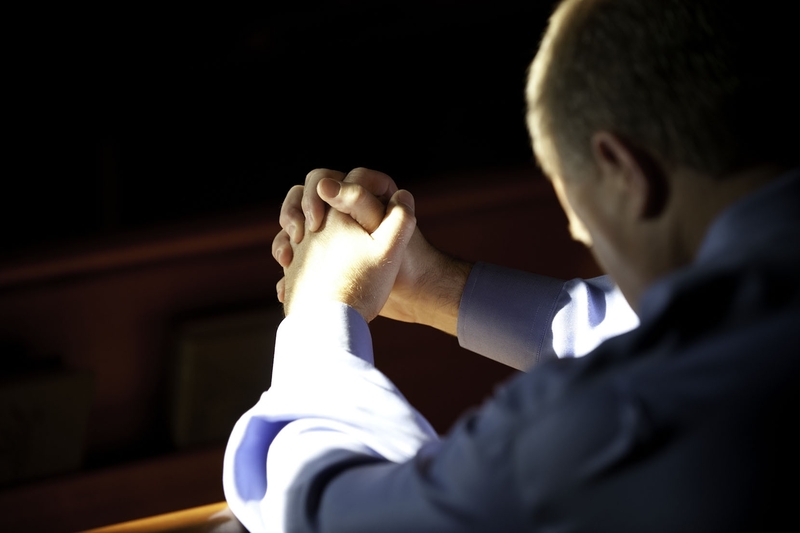 Are you praying – really praying? 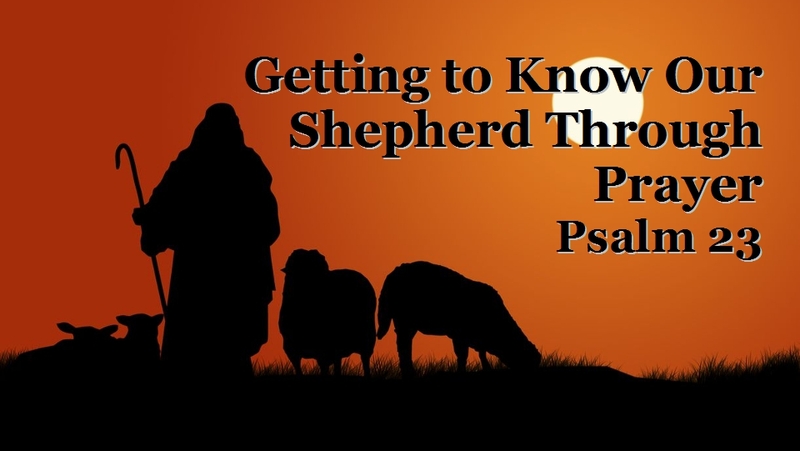 Are you getting to know the Shepherd, or are you just going through the motions? Let me encourage you to give yourself to prayer; not just to give God a “wish list,” but to know Him and experience Him as your Shepherd. In what ways have you gotten to know the Shepherd through prayer? As you and I face the trials and adversities of life, it is very challenging to keep the right perspective. We live, move, work, serve, and struggle in the physical, material world, so that is how we tend to look at things. But the Apostle Paul reminds us that the true battle, true warfare, true struggle is not physical at all: it is spiritual. And this kind of battle is fought on our knees. “We wrestle not against flesh and blood.” This statement seems to contradict everything we face. Our conflicts and challenges are often with other “flesh and blood” human beings! Our health struggles are with our “flesh and blood” bodies. The financial needs and hardships we face are in the “flesh and blood” material world. Even as Christians going through life and ministry, the natural human perspective is that we are facing “flesh and blood” adversaries or opposition. And that affects our attitudes, and even our prayer life. But Paul is trying to get us to see another perspective. In these verses Paul is introducing the concept of the armor of God (vs 11, 13). He describes the Christian’s armor of defense and weapons of attack. Our life is held together by truth, just like a belt. Our heart is protected and kept pure by the righteousness of Jesus. Our feet are covered with the Gospel that we take everywhere we go. Our faith in God and His promises protect us like a shield from Satan’s flaming arrows. Our mind and thoughts are protected by the truths of salvation and who we are in Christ. Our offensive weapon is the mighty Word of God. All of this armor is then empowered by the Christian’s prayer life (vs 18). You see, God’s perspective on life is that it is a spiritual battle, a spiritual war, that is raging against Satan and his demonic forces and strongholds. Our enemy is not our brother in Christ, our spouse, our boss, our co-worker, our neighbor. Our enemy is not our physical body, or the IRS, or electric company. Our enemy is the god of this world, and it is a battle for the glory of God to shine in our life and in the world. And it is a battle that is fought on our knees in prayer. I don’t know the struggle you are confronting right now, but just remember where the true battle is. Remember that “we wrestle not against flesh and blood.” Let’s take our burdens to God, call upon Him for victory in every battle front, and invite His glory to shine and cast out the forces of darkness. Have you ever heard anyone ask, “Do you know who you’re talking to?” Or simply say, “Remember who you’re talking to.” Every once in a while we need people to remind us of who we are are talking to. Maybe we are talking to our parents, our boss, a police officer, or the President. Depending on who that person is, it will affect how we address them and speak to them. Believe it or not, the same is true with prayer. When we open our heart before God, we are speaking to the Creator and Sustainer of the universe, the Almighty God who is holy, holy, holy, the King of Kings. He deserves our utmost respect, reverence, and godly fear. However, if we are born-again believers, God is also our Heavenly Father. 1. God is not bothered by our ongoing requests (vs 5-8). 2. God invites us to make personal requests (vs 9-10). 3. God wants to give you what is best (vs 11-13). I find it strange that we often feel like God would do something to us that we would never dream of doing to our children. Some people believe that God is out to get them, or that He takes pleasure in making us suffer or do without. Jesus knew that some people have this misunderstanding of God, thinking that they could pray for bread, fish, and eggs, and God would answer by sending stones, snakes, and scorpions. That is not our Heavenly Father! If you and I want to give good things to our kids, God’s desires are infinitely greater. Our Heavenly Father puts every earthly father to shame! It may not always feel pleasant at the moment, but God will always do what is best for His children. We need to remember that. Don’t believe the distorted views that many people have of God. When you spend time in prayer, you need to remember your Heavenly Father’s heart. He wants to hear from you. He invites you to come to Him. He delights in giving you His best. It was into one of the darkest moments of national history that God shone a bright light. He raised up a man who would be faithful in the midst of an ungodly world. He would lead God’s people spiritually, morally, politically, and see them transition toward becoming a nation led by a man after God’s own heart. The man whom God would raise up for this unusually dark moment of history was a man by the name of Samuel. It is his life and story that I begin to look at in this new message series entitled, “Samuel: Faithfulness In Ungodly Times.” Listen to this message, and share any comments you have in the space below.